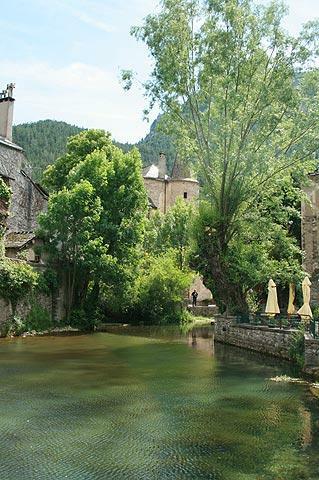 Florac is in the Parc National de Cevennes, in the Massif Central, in the Lozère department of Languedoc-Roussillon. 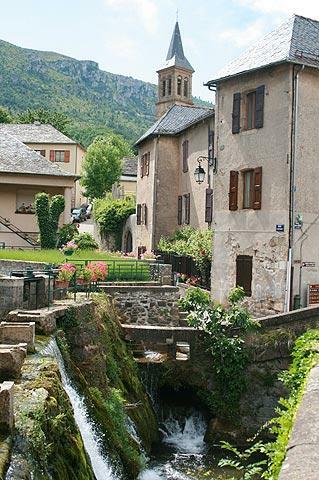 The Cevennes are to the east of the town and the Gorges du Tarn to the west. 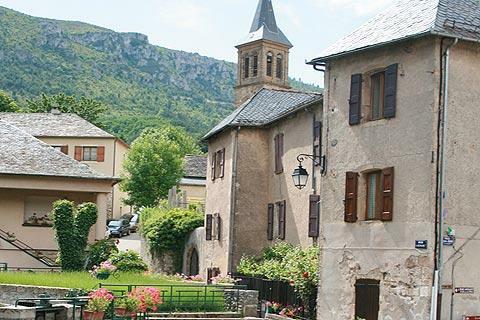 Florac is a pretty small town in an enviable position in the Tarnon river valley, and is the central 'visitor centre' for the Parc des Cevennes. 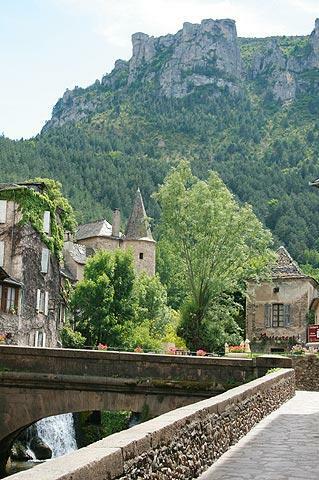 Florac spreads out along the river and up the hillside and makes for a pleasant stopover town. Florac castle is the centre of the town and dates from 1652 although an earlier defensive castle stood on the same location, and was destroyed in the Wars of Religion. The castle has also served as a prison and a salt storage warehouse, before taking on its present role as the regional tourist information office. 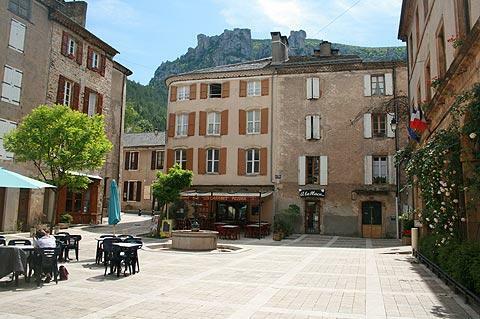 The town itself is quite small, but has two large open squares with restaurants and a few shops - the 'esplanade' is the larger of the two. 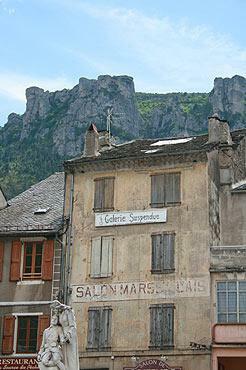 There are also a few smaller streets and alleys to explore to see more of the 'old' town of Florac. The oldest part of Florac, known as le Planet, is around the eastern end of the esplanade. Continue west along the street running parallel to the esplanade, the old merchant's route, and pass by the Saint-Martin Church - take a look also at the facade of the old convent here, an impressive 16th century renaissance building and now a listed historic monument. 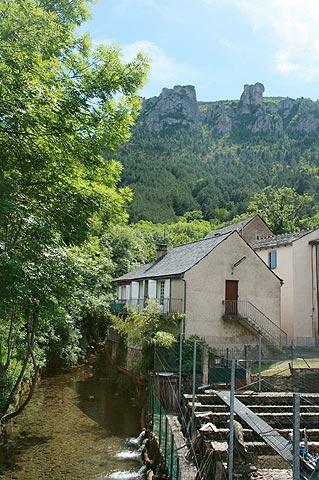 A smaller river (le Vibron) runs down through Florac, and is a centre for fish-breeding - baby trout are raised here to be released elsewhere. There are various ponds along the route of the stream, providing lots of 'pretty buildings reflected in the water' photo opportunities! France This Way comment: it is true that most visitors to Florac are here to explore the scenery of the Cenennes National Park and the Gorges du Tarn, but allow time to explore the centre of Florac: the historic buildings, the setting with the mountains omnipresent behind the town and the presence of the Tarn and Tarnon rivers in the town centre make it a very pleasant place to visit. Behind the town (access from the parking behind Florac castle) there is a pleasant wooded park area with plenty of space for picnics and for children to run around, and a nice cool place to escape the heat. The nearby village of Bédouès is worth a visit - you can't miss the unusual belltower as you approach the village - and Florac is also close to the many menhirs to be found around La Cham des Bondons. 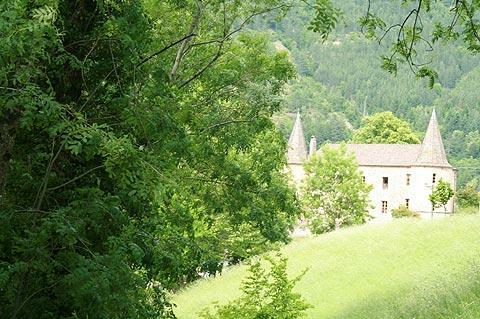 Visitors hoping to explore the Cevennes National Parc more thoroughly will want to visit the Chateau de Florac, the headquarters for the parc and source of much information to help your visit, while a trip along the very scenic Gorges du Tarn to the west is also highly recommended.